We used a water distiller in our house from 2004-2012, then we switched to a Berkey. So I decided to make a little video about why I switched, and why I love it so much. If you can’t watch the video, here are the five reasons why I love my Berkey Water Filter. 1) It removes hundreds of contaminants: Bacteria and parasites, heavy metals like lead and mercury, VOCs and toxic chemicals like benzene, chlorine and chromium-6 (think Erin Brockovich), pesticides, pharmaceutical drugs and more, to levels higher than 99.99%. 2) The fluoride/arsenic filters remove 95% of fluoride and arsenic. The fluorosilicic acid your city puts in your water is a toxic waste product of the phosphate fertilizer industry. It poisons your body, does not help your teeth and most filtration systems do not remove it. 3) It’s gravity fed! So it doesn’t need electricity or water pressure. You just pour water into the top chamber and it filters down into the bottom chamber, clean and ready to drink. 4) It’s portable. We take ours on vacation with us and it’s perfect to have in an emergency situation like an earthquake, hurricane, WWIII or a zombie attack. We will never have to worry about not having clean drinking water. This thing will even filter pond water! 5) It’s extremely economical. The Big Berkey (2 gallon model) costs about $250, which may seem like a lot of money for a water filter, but get this: The two Black Berkey filters inside will purify 6,000 gallons before needing replacement. If you drink 10 gallons of water a week, it will last you about 11 years at a cost of less than 2 cents per gallon. Most water filters need replacing after 3-6 months! Berkey was even rated #1 for contaminant removal by Natural News Water Filter Labs. And the best part, the water tastes clean and delicious. You will definitely notice a difference. Berkey filters come in different sizes from the cute little 1.5 gallon Travel Berkey all the way to the monster 6 gallon Crown Berkey. We started with a 2 gallon Big Berkey, but eventually upgraded to the 3 gallon Royal Berkey, which is perfect for our family of four. The Travel Berkey is great for dorm rooms too. Note: The fluoride/arsenic filters are extra and should be replaced annually. The Black Berkey purification elements have a two-year prorated manufacturers warranty. The Berkey systems themselves and their components (stainless steel, etc) have a six-month manufacturers warranty. BigBerkeyWaterFilters.com will replace any replacement parts such as washers, nuts, etc over the life of the Berkey system ownership. BigBerkeyWaterFilters.com has tons of FAQs, comparisons with other brands, test results, videos and more. Every question I could think of was answered there. A few add-ons I recommend are the sight glass, so you can easily see the water level inside, the shower filter to clean up your shower water, and the travel bottle. 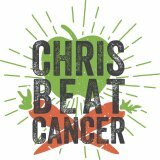 Chris Beat Cancer readers get 5% OFF any ceramic filter system, just use the coupon code “chrisbeatcancer” at check out!